Andrew Luck vs Robert Griffin III - Who Has Hotter Football Cards? Although they still don't have an NFL home, Andrew Luck and Robert Griffin III are heating up the hobby. The two quarterbacks are expected to go one and two in the 2012 NFL Draft. They have a built-in rivalry that will draw comparisons for years to come, good or bad. All early season football card sets are pushing the two very strong. 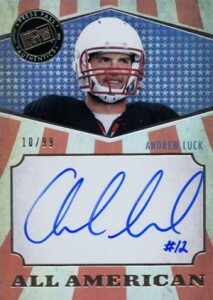 Andrew Luck and Robert Griffin III autographs are bound to be some of the desirable cards of 2012. But looking into the future, who's a better bet? Prospecting sets from Press Pass, Leaf and SAGE offer a glimpse. With Andrew Luck's exclusive deal with Press Pass, it makes an in-depth comparison difficult. Still, eBay does offer some good insight. And let's just say they're both hot. Thus far, Andrew Luck's autograph has only appeared in 2012 Press Pass Rookie Football. The top sale has been $399 for a Power Pick Signature numbered 12 out of 50 (Luck's college jersey number). The card sold for $399 on April 1. Most other autographs from the set are now closing in the $200 range. Serial numbering is largely a non-factor. Robert Griffin III autographs have appeared in several sets already. The top RG3 card sales come from 2012 Leaf Metal Draft Football. A Red Prismatic parallel numbered to 5 broke the four-figure mark, selling for $1,009 on March 20. 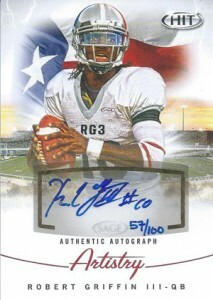 Other 2012 Leaf Metal Draft Football Red Prismatic Robert Griffin III autographs have sold for $899, $760.01 and $760. Green, Blue and Purple Prismatic autographs have all closed for more than $400 as well. RG3's basic Leaf autographs as well as his Press Pass and 2012 SAGE Hit Series signatures are all hovering around the $175-200 mark. While Griffin's had the higher individual autograph prices, the sweet spot for both appears to be a toss up at this point. Both Luck and Griffin have some rare cards that are likely to command a premium for years to come despite their status as oddball cards. Throughout the 2011 NCAA season, Baylor sent out five different cards promoting RG3 as a Heisman Trophy candidate. The cards were intended for media only and many were probably swept into desks or tossed. So far in 2012, none of the five cards have been listed on eBay. Late last year, a couple sold for more than $100. However, in the future these cards could have strong potential as they're made by the school. So while not officially licensed, they do have some provenance. In January, Leaf offered some Andrew Luck cards commemorating his participation in the U.S. Army All-American Game. The card maker sold the cards directly via eBay. However, when it was discovered that the cards had multiple spelling errors, Leaf halted sales. They did, however, honor the 39 Prismatic cards that had already sold. The cards are serial numbered to 350 but only the first 39 are in circulation. Sales of the cards have been extremely high. On March 20, a BGS 9.5 version of the card sold for $1,999. Other recent sales for ungraded copies reached $1,000 and $800. The cards have risen dramatically as well. Two months ago, the Andrew Luck error cards were selling for around $300. The novelty of the error card makes it stand out more than some of his other pack-inserted parallels that are numbered to 5 and 10 copies. As a result, the prices are much stronger, despite the higher overall print run. It has become an iconic oddball card in a short amount of time, which will make it memorable for years to come. Collectors will have no shortage of options for Andrew Luck and Robert Griffin III cards in the months ahead. Both will be cornerstones for 2012 Topps and Panini products. Topps has already made this very clear, promising autographs throughout their lineup. Panini has yet to confirm their 2012 plans, but it's all but assured that both play into their plans as well. Luck's exclusive deal with Press Pass is limited to non-NFL sets. This will not prevent Panini or Topps from making Luck cards. It's still too early to declare which young quarterback is more popular with collectors. Overall, similar cards are following similar patterns. While there are some notable exceptions, they go both ways. Collectors should be the winners here. With two standout quarterbacks in the same rookie class, plus several other potential stars like Trent Richardson and Justin Blackmon, 2012 football card products have some big long-term potential. While it's bound to create a frenzy over the course of the season, such a deep rookie crop might make squirreling away some unopened product not a bad idea either. 2012 Prime Signatures Rookie Prime Materials Robert Griffin III BGS 8 Auto 10.